- New Clean X1 26” frame, developed in Spain by UCI World Champion Abel Mustieles, the owner of Clean. - The new Clean X1 26” frame is the first 26 inches frame by Spanish bran Clean, that’s why it’s been tested and developed for more than 6 months by world class riders like Sergi Llongueras and Gilles Coustellier. - Features a tapered headtube design, for 1 1/8” – 1,5” tapered headsets, which allows you to run a larger lower bearing than internal headsets, increasing its durability and frame’s overall front stiffness. 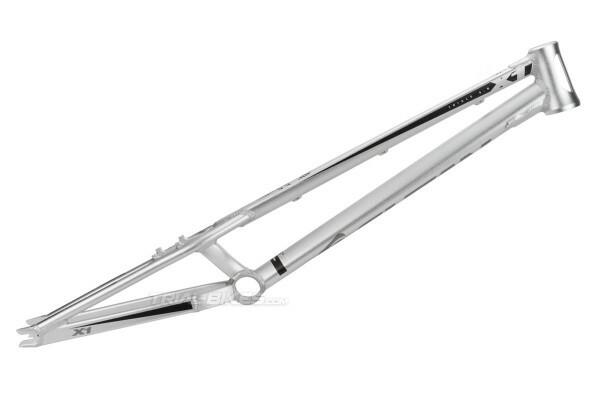 - The headtube has 2 large side holes that help remove unnecessary material. 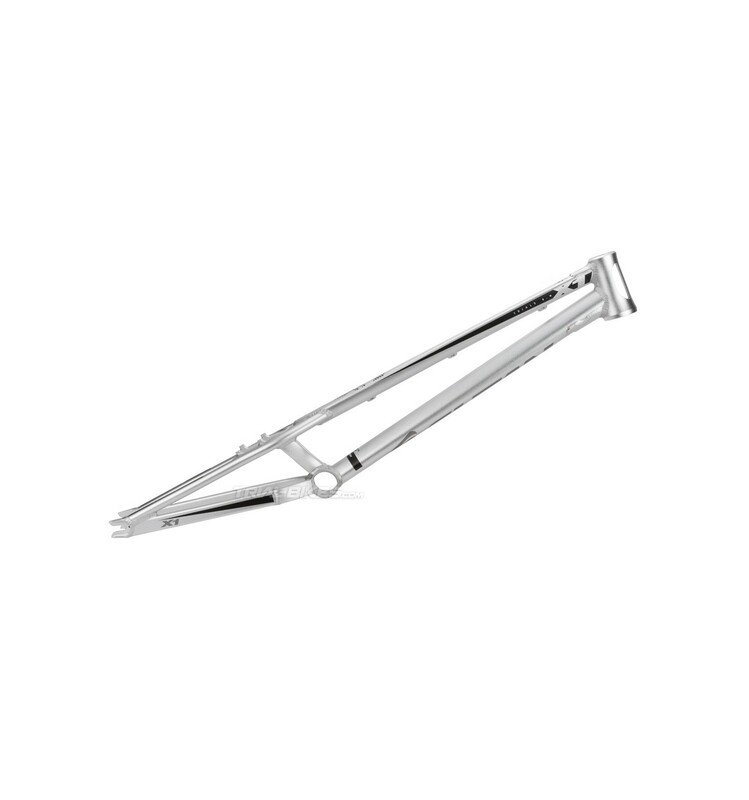 - The main tubes both have a reinforcement plate gusset at the headtube joint, which increases front end’s stiffness and also prevents the frame from cracking at this area. - Furthermore, the down tube joins the bottom bracket shell asymmetrically: instead of joining it at its centre, the BB shell is offset to the left. This allows for minimized frame flexion when pedaling, since the freewheel is now closer to the main tube. - 90mm wide bottom bracket shell, thread less, designed to use a Press Fit BB30 bottom bracket (won’t fit other systems). - Features 2 seat tubes instead of one, shaped like a triangle to increase strength and stiffness considerably. - The seat stays are joined to the top tube with a built-in brake booster, essential to avoid rear-end flexion. - Contoured chain and seat stays provide extra clearance to prevent tyre or crank rubbing. - The right chain stay is manufactured in 2 pieces, and features a CNC-machined reinforcement at the bottom bracket joint, whereas the left chain stay is made in 1 piece, from the BB to the left dropout. - 4-bolt rim brake mounts, integrated in the built-in brake booster and spaced t 100mm. 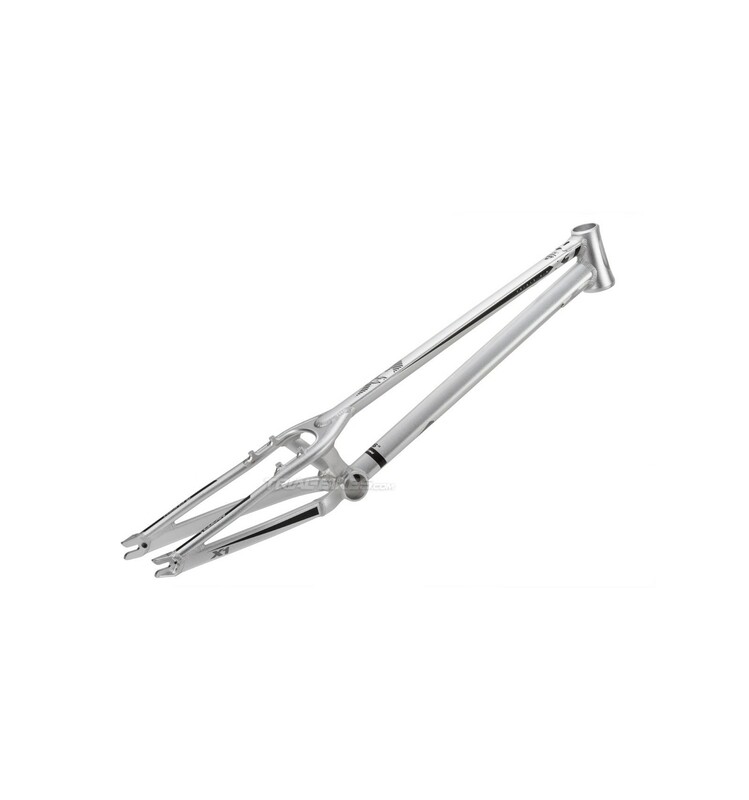 - Features CNC machined horizontal dropouts, with rounded ends to ease wheel installation. - 116mm spacing for the rear hub, designed to use snail cam chain tensioners. - Anodized silver finish, with blak and grey Clean X1 graphics. - 1) Headset. 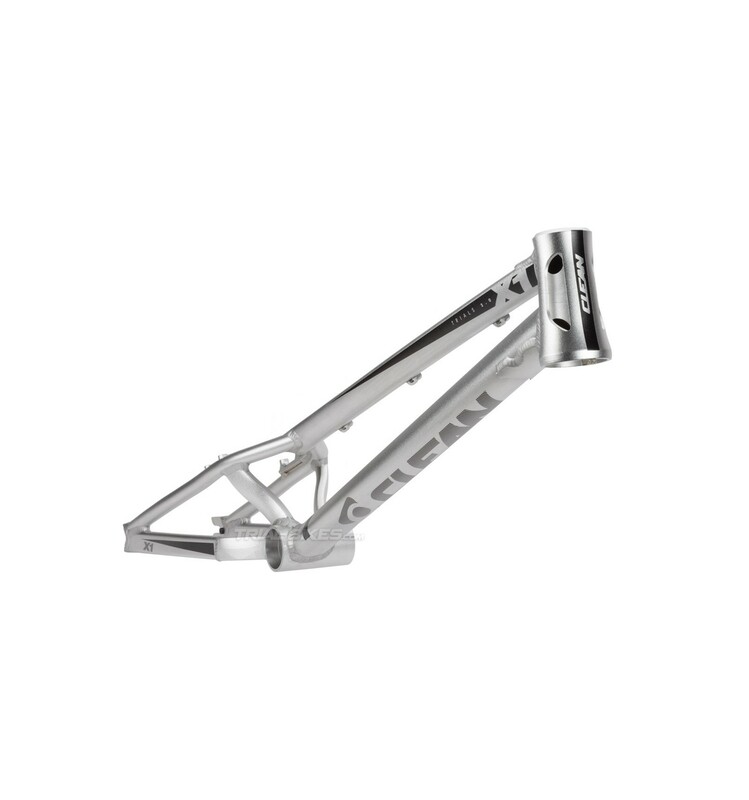 Since the headtube on this frame is tapered, with 1 1/8” top and 1,5” bottom diameters, it’s compatible with 1 1/8” – 1,5” tapered forks. If you’d like to use a standard 1 1/8” diameter fork, you can install an adaptor for the bottom cup, as in the one supplied with Clean’s 1 1/8” – 1,5” tapered headset, available on our catalogue. - 2) Bashplate. As usual on most 26” frames, this frame doesn’t have bashplate mounts. Therefore, a bashring must be used to protect the freewheel, like the ones you can find in this section. - 3) Bottom Bracket. A Press Fit BB30 thread less bottom bracket must be used. This means the cups are pressed into the BB shell instead of threaded onto it, using BB30 bearings (reference 6808-2RS), as in the Clean bottom bracket. - 4) Rear Brake. This frame has 4-bolt rim brake mounts, so be sure to use a rear rim brake of that type. The spacing between bolts holes is 100mm. - 5) Chain tensioner. This frame is designed for use with snail cams. Since the dropouts are spaced at 116mm, the rear hub plus the 2 snail cams width must add up to 116mm. - 6) Rear hub. Since this frame is designed for use with snail cams, the rear hub plus the 2 snail cams width must add up to 116mm. - 7) Fork. The steerer tube on your fork must be long enough so that at least 2mm of it remain above the top bolt of your stem’s steerer tube clamp. To ensure this, you must add the length of the headtube (120mm for this frame), plus the cups bits that sit outside the headtube, plus the headset spacers (if any) and/or dust cover sitting under the stem, plus the length of your stem’s steerer tube clamp. Once you’ve done this, you’ll be ready to know if your fork is long enough so that at least 2mm of it remain above the top bolt of your stem’s steerer tube clamp. This frame comes with a 1 year warranty covering manufacturing and materials defects. Damage incurred from collisions and impacts with obstacles may have a negative effect on the outcome of any guarantee claim. TYPE OF HEADSET Tapered 1 1/8 - 1.5"